After rescuing over 7,350 people off of the mountains in 2012, it's no wonder why GOPR, a volunteer rescue team in the Polish mountains of Cracow, is in need of new equipment to assist in saving lives. To help fill the gap, Warsaw-based designers Gustaw Lange and Aleksander Lange, of design firm Lange & Lange, have created the GOPR Rescue Snowmobile - an ambulance for the snow. On a daily basis, GOPR is called to rescue people due to accidents involving extreme sports, avalanches, bad weather, inexperience or recklessness. More than often, the injury that is sustained on the mountain will lead to serious fractures of limbs or the spine. Even though GOPR is outfitted with 60 off-road vehicles and passenger cars, 49 four-wheeled vehicles, and 45 snowmobiles, there is a need for a machine that can get the injured off of the mountain fast, while keeping their bodies flat. 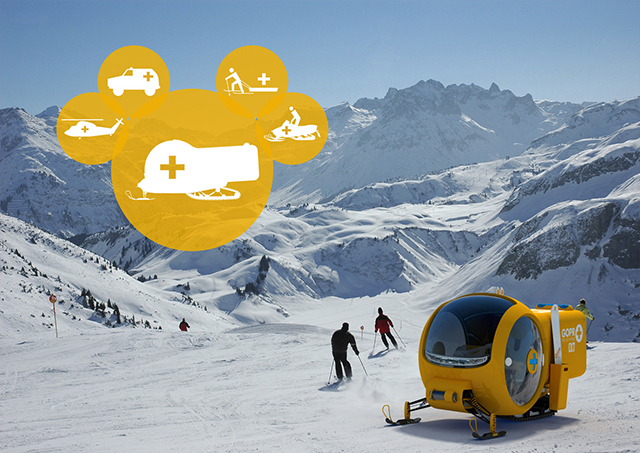 The GOPR Rescue Snowmobile is a bright yellow vehicle that can sustain difficult weather conditions, and get the injured onto a medical bed right away. The vehicle is mobile, maneuverable, and gets easily to places which are difficult to access for other modes of rescue transportation. The two-seater can swiftly push through the snow with the two ski's that help guide in the front, and a central undercarriage mechanism that operates as a powerful system to propel the machine over all types of terrain. The bubble-like shape of the vehicle's front allows for a pair of rescuers to retrieve and assist the injured, while the rectangular shaped rear functions as a medical bed for the injured. 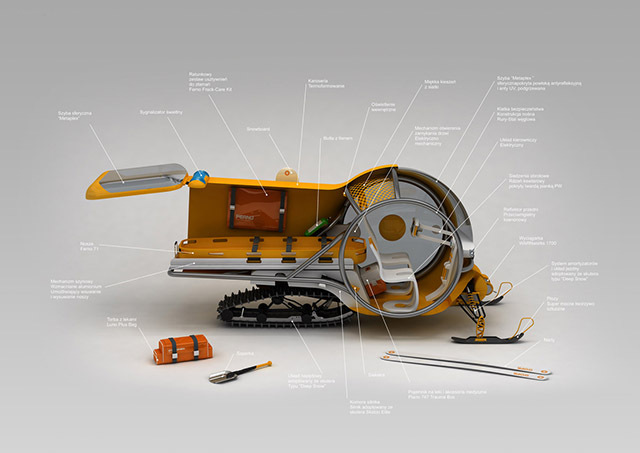 Ultimately, Lange & Lange's affordable GOPR Rescue Snowmobile will enable GOPR's rescuers to make swift and efficient rescues off of the mountain.